Defensive structure built by the Pisans in 1322, now part of Palazzo Boyl. At the beginning of the 14th century, Pisa built imposing towers to strengthen its stronghold in South Sardinia. The Lion Tower was built in 1322 but it was never completed. Not very high and equipped with not particularly robust walls, due to the materials used in its construction, it soon lost its defensive function of the southern side of the Castle. Over time it became the headquarters of the general administrator of the kingdom, artillery warehouse and even astronomical and geodetic observatory. 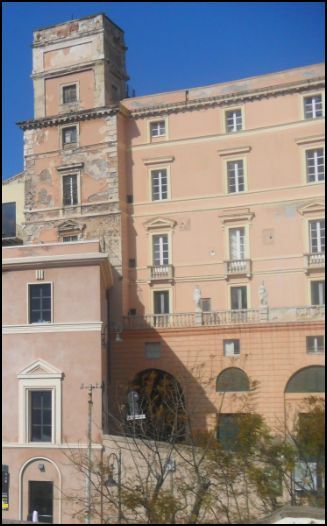 Severely damaged by fire in 1781, in 1840 it was completely incorporated into the adjacent Palazzo Boyl. The Lion Tower, currently not open to visitors, has not lost its function of entry to Castello district, overlooking the Portico delle Grazie, a charming barrel-vaulted passage, located between the streets De Candia and Lamarmora.